StreetPrintXD™, also known as TrafficPatternsXD™, provides increased performance and durability in more demanding and high traffic environments. 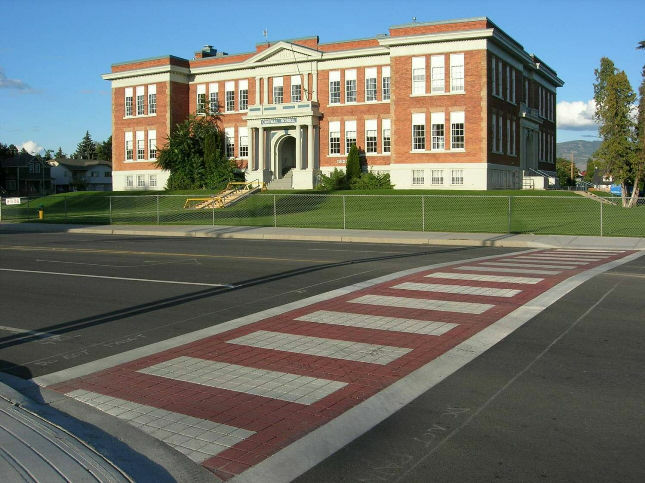 Designed primarily for crosswalks, commercial entrance ways and parking lots, StreetPrintXD™ gives an authentic brick look without the trip hazards and ongoing maintenance often associated with brick pavers and stamped concrete. StreetPrintXD™ is an extremely durable thermoplastic material that incorporates a unique aggregate-reinforced formula with unprecedented wear resistance. Supplied at 180 mil thickness, the 2’ x 2’ sheets of material are easily positioned, heated, and then stamped into the asphalt. The StreetPrintXD™ installation process starts in the same manner as original StreetPrint; however, instead of coating the printed asphalt with StreetBond™ as is done with original StreetPrint™, the surface is instead treated with a thick, tough layer of unique aggregate-reinforced thermoplastic. This StreetPrintXD™ material is melted onto the surface, after which it is sanded and post-printed to create an authentic brick appearance with a skid resistant texture.